1.9 How To Apply For HAL Assistant & Operator Recruitment 2019? Hindustan Aeronautics Limited (HAL) has released the latest notification for 77 Assistant (Admin/ Accounts), Assistant (Q.C./ Inspection)/Assistant (Commercial), Assistant (Civil Works), Operator (Fitter), Operator (Electrician), Operator (Electronics Mechanic), Operator (Instrument Mechanic) posts. Candidates who are interested to work in Lucknow they can apply for HAL Assistant & Operator Recruitment 2019. In this article, we can give more information about Hindustan Aeronautics Limited (HAL) Notification 2019. Applicants who are interested in this hal-india.co.in Jobs 2019, they can apply from 30th January 2019 to 13th February 2019. Here applied candidates can get more details on Hindustan Aeronautics Limited (HAL) Notification 2019 such as educational qualifications, age limit, selection process, post-wise vacancies, important dates, internal links, others. Name Of The Post Assistant (Admin/ Accounts), Assistant (Q.C./ Inspection)/Assistant (Commercial), Assistant (Civil Works), Operator (Fitter), Operator (Electrician), Operator (Electronics Mechanic), Operator (Instrument Mechanic) Posts. In this section, candidates can get detailed information about post-wise vacancies for HAL Assistant & Operator Recruitment 2019. Applicants who are ready to apply for this notification you can get more information about the educational qualifications of HAL Assistant & Operator Recruitment 2019. Candidates can check the official notification for more details on educational qualifications. Regular/Full-Time Master Degree in Commerce (M.Com) with relevant certificates of proficiency in PC Operations (Minimum of 3 months duration). 3 years Regular/Full-Time Diploma in Mechanical Engineering from any Board of Technical Education. 3 years Regular/Full-Time Diploma in Civil Engineering from any Board of Technical Education. Applicants who are interested to apply for these posts, they can get detailed information about the selection process in the below section. The candidates are required to deposit an Application Fee of Rs. 200/- (Rupees Two Hundred only) which is non-refundable. Application Fee is fully exempted in the case of SC/ ST/ Persons with Disabilities (PWDs)/ Ex-Apprentices of HAL & Candidates registered/ enrolled with any Employment Exchange under U.P. & Zilla Sainik Welfare Board. Candidates we mentioned the information about salary details in this section. Maximum Age Limit For UR: 28 Years. Upper Age Limit For OBC(Non-creamy layer): 31 Years. Maximum Age Limit For SC/ST: 33 Years. How To Apply For HAL Assistant & Operator Recruitment 2019? Initially, candidates have to visit the official website of Hindustan Aeronautics Limited (HAL) that is hal-india.co.in. The home page will be opened on the screen. In that go to the careers section, which is at the top right of the home page. You can search for the HAL Assistant & Operator Recruitment 2019 link. Then click on that link, read the complete notification carefully. 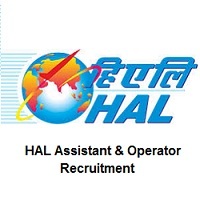 If you are eligible then apply for the HAL Assistant & Operator Recruitment 2019. Recheck the application form correctly or not. Take print out of HAL Assistant & Operator Recruitment 2019 application form for further reference. Our team Sarkari Naukri had given the complete and genuine information regarding the HAL Assistant & Operator Recruitment 2019 which are very beneficial for all the applicants. Candidates can bookmark our site by clicking Ctrl+D, and also see the more information about syllabus, previous papers, admit cards, others. And they can also share this information with their friends also. Applicants have any questions, they can leave us a comment in below section.